Consult PR is pleased to announce that Mr. David Blotnick has assumed the role of Chief Executive Officer as of September 18, 2017. 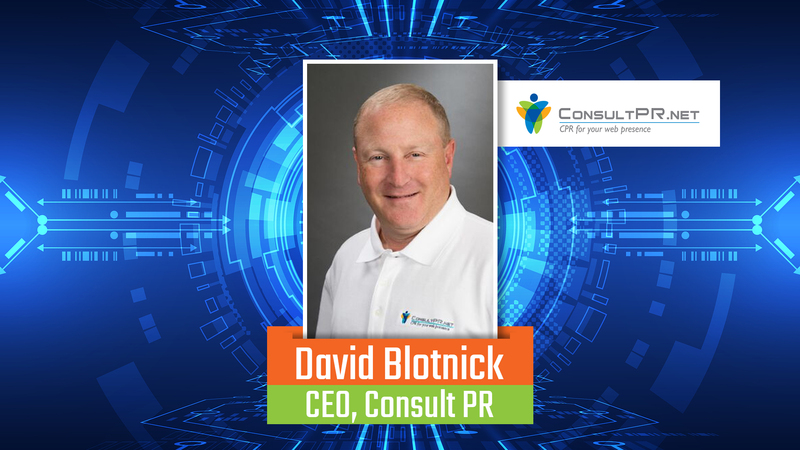 Mr. Blotnick joined Consult PR in mid 2015 as a Principal Partner and Chief Operations Officer. Over the past two years, the innovation he has brought to the firm along with his experience and leadership skills led to the decision to fill the long vacant CEO role. Mr. Blotnick brings over 25 years of top-level managerial experience in business development, finance, leadership, and goal-setting to the team. His strong track record of streamlining organizations, analyzing existing systems and procedures, and making improvements that directly impact the bottom line are skills matched by few in our industry. He was recently quoted as saying, “We will continue the direction of offering the best in customized digital services to all of our valued customers.” Consult PR employees and clients alike are enthusiastic and optimistic about the direction the new CEO will take the firm. David is married and has four children; one daughter is a graduate of Florida State, another from Boston College, and one who is attending Whittier College. When David is not working, you can find him skiing, fishing, or watching a myriad of sports, although he’ll be cheering for any team associated with Boston. An avid foodie, David is always on the lookout for great restaurants in South Florida and during his travels for business and pleasure. David is a results-oriented leader whose years of experience are a perfect fit for the vision held by Consult PR to expand their offerings, their team, and their clientele. His ability to establish a positive rapport within the community and the global divisions within the company is what truly helps to establish Consult PR as a solid company. David is a dedicated team player and a leader who guides Consult PR and its clients towards their ultimate goal of client satisfaction without sacrificing quality of service. Consult PR’s consultative approach with clients stems from their corporate culture that thrives on educating clients on what's possible on the internet, with needs-based solutions and world class customer service at the heart of the firm. They are more than just consultants - they seek to become a strategic technology partner and have the talent and team members in house to recommend, engineer, deploy and measure all of a client’s digital initiatives. They are quite simply a one stop shop for everything web, from websites to digital marketing (SEO, Social Media, PPC, etc. ), phone apps, custom cloud software and web applications, public relations, book marketing, and more. Please join Consult PR in congratulating their new CEO, Mr. David Blotnick on his ascension to the helm of their firm!